CET Color’s NEW 5′ x 10′ Andes flatbed cutter features a multi-functional head for quick tool changing. Available functions include oscillating, creasing, cutting, drawing, kiss cutting, routing, V-cutting, rotary cutting for fabric, and foam oscillating. The machine is compatible with materials such as Dibond, and more. This entry was posted in New Equipment, Vendor News and tagged Andes, Auto-Loader, CET Color, Flatbed Cutter, Wide Format Solutions on July 14, 2017 by Billi Jean Johnstone. Atlanta, Georgia, USA; May 2017 – CET Color – a manufacturer of wide-format UV flatbed and hybrid printers, announces the latest in their line of equipment. 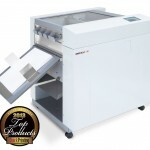 The 3200UVRTR printer is a 126″ roll-to-roll UV printer which has 2 Kyocera print heads and can boast up to 4. The unit has the capability of C, Y, M, K, Lc, Lm and WW; this unit supports Onyx or Caldera RIP software. This 3200UVRTR is able to print on various substrates including backlits, banners, mesh, vinyl and etc. This unit also features a built in light source so you can back light your material before it goes to the take up reel, making this unit leading edge technology for the UV market. CET Color offers a complete line of wide format UV printers, as well as recently introduced flatbed cutter, for use on a broad range of substrates. Their 80,000 square-foot facility, located in Atlanta, GA, includes an extensive warehouse and printer assembly hall, in addition to a large demonstration center. This entry was posted in New Equipment, Vendor News and tagged 3200UVRTR, CET Color, Roll-to-roll printer, Wide format printer on June 19, 2017 by Billi Jean Johnstone. IDEAL – Did you know? Nothing can replace a walk in the forest, at the seaside, or in the mountains, and nothing is more important than clean and fresh air to breathe. But how can this work in your everyday professional life? Professional air purifiers create a non-polluted environment, where people feel well in a natural way. For more productivity and performance. Nature’s self-cleaning. The interaction of plants and sun provide us pure air to breathe. Plants, and above all, tress filter harmful particles form the air, sunlight supports the reduction of pollutants from the atmosphere. Cleaning of indoor air. IDEAL air purifiers help to improve the air in you room or office. People who can breathe clean and healthy indoor air fall ill less often and are more efficient. Good clean air with no pollutants is attainable with IDEAL’s air purifiers. IDEAL Air Purifiers are available for room sizes ranging from 150 square feet to 1,000 square feet. For additional information on IDEAL’s Air Purifiers, visit us online by clicking here! This entry was posted in New Equipment, Vendor Profiles and tagged Air Purifiers, Clean Indoor Air, IDEAL, MBM, MBM Corporation on May 9, 2016 by Billi Jean Johnstone. Why Paper & Plastic Banding? Felins offers a variety of banding machines and banding materials ranging from easy to use table top banding machines to fully automated banding systems. For additional information, contact us at 1-800-343-4231. CE Models – This semi-automatic, heat seal, table top banding machine efficiently bundles a wide variety of products and can band with both paper and plastic banding material interchangeably. The CE Models are easy to set-up, use, and maintain. Featuring digital controls, adjustable tension, highly versatile for limitless applications, and does not require costly compressed air. JD Models – An economical alternative to rubber banding or twist tying is the JD Series, heat seal banding machine. This model offers a versatile and compact table top design for gently banding your products. The JD series utilize a heat seal and loop style banding. Highly versatile for limitless applications and does not require compressed air. Multiple material selection options available. Need help deciding? Contact us today for additional product information and additional options available to suit your needs. Contact us at 1-800-343-4231 or visit us online at www.midstatelitho.net. This entry was posted in Bundling and Banding Solutions, New Equipment and tagged Banding Solutions, Bundling Solutions, Felins, Paper Banding, Plastic Banding on November 5, 2014 by MSL. OKI introduces the revolutionary new multimedia production platform. Print on heavy media stock (up to 360 gsm). Print in Cyan, Magenta, Yellow, Black, and White or Clear. The C941dn with white toner allows you to get creative when printing on colored media. This video demonstrates the value of using white selectively, showing examples of different techniques you can use to ensure that you get great results every time you use your C914dn. Now you can demonstrate your creativity or broaden your printed offerings by producing materials on an incredible range of media in 4-color plus solid White or Clear gloss toners. These processes – which used to require expensive printing equipment and outside resources – are available in-house and on demand with the C941dn, a unique 5-station multimedia production platform device from OKI. Visit us online at www.midstatelitho.net or OKI C900 Series for additional information! This entry was posted in New Equipment on October 30, 2014 by MSL. Manufacturing is one of the fastest changing parts of our society. Developments in products, materials, processes and procedures all have the ability to upset the status quo and usher in a new way of thinking about the same old stuff. Things don’t stop once we improve a process, instead they improve again. Today we’ll look at how automatic machines are now becoming autonomous. Efficiency is key. Whether it’s less waste, cheaper materials, or faster output there is always room for more efficiency and as a natural order our processes relentlessly move towards it. We’ve seen milestones countless times but this latest one is a doozy. Major computational improvements combined with distinct process knowledge are turning automated equipment into autonomous equipment. But what’s the difference? Equipment in manufacturing has been becoming automated for decades. The definition of these words are distinct yet close enough to leave some confusion. In terms of manufacturing I define automatic as a motor assisted function that does what a human typically would do manual. What makes autonomy special is that there’s a higher level of control over automatic functions; controlling them independently with a decision making process. In simpler terms, our equipment is getting smarter and beginning to make production decisions on its own. There are also intelligent management systems that can oversee entire production scenarios. Tools like PXnet from Horizon give production managers a very detailed bird’s-eye-view of an entire facility or even multiple locations. Just having a view of the big picture can allow humans to observe processes under a new light, giving way to a whole new era of breakthroughs. Specific equipment solutions are incorporating autonomy in new ways as well. Machines like the MBM Aerocut G2 or the Horizon CRF-362 are perfect examples. Both require a very minimal setup and of course the operator is still required to load and unload stock from the machine. However, once the machine begins its production, there are all kinds of things happening in the background that lead to seamless operation with minimal operator interaction. The Aerocut carries out no less than 4 separate operations on each sheet before delivering a finished product. The CRF-362 determines its own speed and gap settings, things that confuse new operators and cause management to worry about quality. This form of development is exponential, it’s constantly building on itself and each step just leads us to higher goals. It’s a pleasure of mine to watch these things happen in the industry I love working in. It can be a struggle for those who are late to adopt modern equipment, they are left competing on an uneven battlefield. It’s also difficult to know when the time is right and have the gusto to pull the trigger in uncharted territory. It leaves me humble about my customers and their struggles as I try to explain the benefits of buying into automation while they grapple with costs and risks. This entry was posted in New Equipment, Tips & Advice on October 3, 2014 by MSL. What remains the same is the easy “green button” operation that provides virtually labor free laminated and trimmed sheets. Excellent adhesion to even the most difficult digital prints with the same ASAP adhesive films pioneered on the ALM3220. See what the ALM3222 can do for you! This entry was posted in New Equipment and tagged 2-Sided Lamination, ALM3222, Automatic Laminator, Drylam, Laminator on August 6, 2014 by MSL. NEW Rotary Die-Cut System for Digital & Offset Print! New Horizon RD-4055 can die-cut, kiss-cut, crease, slit, perforate, hole punch, and round corner with various substrates. Standard is pleased to announce the New Horizon RD-4055 Rotary Die Cutter. It is designed to meet the growing demand for short-run die-cut product, with the ability to die-cut, crease, perforate, slit hole punch, and round corner in one process for digital and offset printed sheets. This system features easy change-over and simple operation. Both setup and control can be done through an intuitive touchscreen that displays easy-to-understand graphical illustrations. Vacuum belt feeding enables superior feeding. And, an ultrasonic sensor is used for double-feed detection on a wide range of substrates. Die-cutting and Kiss-cutting can also be performed at the same time, which makes the RD-4055 ideal for producing stickers and labels. Feeds, die-cuts, and separates in one pass at speeds up to 6,000 cycles/hour. Creasing can be achieved to avoid image cracking making it suitable for boxes, pocket folders, and greeting cards which require an additional folding process after die-cutting. Lastly, a “Repeat Register” function allows multiple-up applications from a single-up die to minimize costs. Even run up to five repeats in a single pass! Now that’s a die cutter! This entry was posted in New Equipment, Vendor News and tagged Die Cutting, Horizon, RD-4055, Standard on July 13, 2014 by MSL. 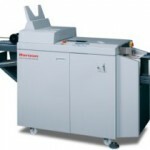 The NEW Standard Horizon CRA-36 AutoCreaser processes high quality creasing with an automated feeding function. Perforation can be performed by simple unit replacement. Rotary perforation, edge trim and gutter cut also possible in one pass as option. Designed for digital and offset printed sheets, the CRA-36 eliminates cracking common with digital print, cross grain and UV coating. Applications include greeting/note cards, menus, tri-fold brochures, book covers and dust jackets, coupons, tickets and more! The NEW Standard Horizon CRA-36 will be available soon! Visit us online for additional information at www.midstatelitho.net. This entry was posted in New Equipment, Vendor News and tagged AutoCreaser, CRA-36, Creaser, Horizon, Standard on June 30, 2014 by MSL. Standard Horizon has announced the NEW Standard SD710 Digital Duplicator, which replaces the SD700. The SD710 is energy-efficient without compromising print quality or productivity. It consumes less energy than conventional high-speed printing systems to make a bigger impact on your workflow and a smaller impact on the environment. The SD710 is a versatile, high-speed digital duplicator that produces up to 135 press-like quality images per minute with incredible reliability. It can handle the most demanding tasks faster, more efficiently, and more economically. The Standard Horizon SD710, with press-like quality and unparalleled ease of use, adds a new dimension to digital duplicator printing. Combining the latest innovations in ink and master technology, the SD710 has a printing speed of up to 135 sheets per minute. For additional information, CLICK HERE or visit us online at www.midstatelitho.net. This entry was posted in New Equipment and tagged digital duplicator, SD710, Standard on June 30, 2014 by MSL.